A Palestinian family is suing Ehud Olmert, Israel's outgoing prime minister, and other government officials over the deaths of their relatives during the recent assault on Gaza. The al-Samouni family, which saw 29 of its members killed in the conflict, filed the case in Jerusalem on Tuesday, seeking $200m in damages for "criminal negligence". The al-Samounis say Israeli soldiers raided their homes in the middle of the conflict, and moved the extended family together into one house. According to the survivors' accounts, partly corroborated by the International Red Cross and the United Nations, shells and missiles fired by the Israeli military hit the house the following day, leaving 29 people dead. Two months after the attack, the remaining al-Samounis live in a makeshift tent amid the rubble of their former home. A Turkish state prosecutor has launched an investigation into claims of Israeli crimes against humanity and genocide during a recent deadly offensive in the Gaza Strip. The group accuses 19 Israeli officials, including Prime Minister Ehud Olmert, President Shimon Peres, Foreign Minister Tzipi Livni and Defense Minister Ehud Barak of committing genocide and crimes against humanity in Gaza. The investigation was launched under Article 13 of the Turkish Penal Code, which allows Turkish courts to try those charged with committing genocide and torture, even if the crime was perpetrated in another country. The Palestinian Authority is pressing the International Criminal Court in The Hague to investigate accusations of war crimes committed by Israeli commanders during the recent war in Gaza. The Palestinian minister of justice, Ali Kashan, first raised the issue during a visit to the court’s chief prosecutor late last month, and he and other officials are due back again in The Hague this week, court officials said. The prosecutor has received more than 200 requests to look into allegations of war crimes during the recent fighting between Israel and Hamas militants. They include accusations from individuals and organizations that Israel violated the rules of war by singling out civilians and nonmilitary buildings, and by using weapons like white phosphorus illegally. The international criminal court is considering whether the Palestinian Authority is "enough like a state" for it to bring a case alleging that Israeli troops committed war crimes in the recent assault on Gaza. The deliberations would potentially open the way to putting Israeli military commanders in the dock at The Hague over the campaign, which claimed more than 1,300 lives, and set an important precedent for the court over what cases it can hear. The latest moves in The Hague come amid mounting international pressure on Israel and a growing recognition in Israeli government circles that it may eventually have to defend itself against war crimes allegations. 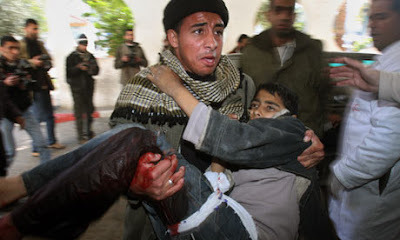 The Guardian has also learned that a confidential inquiry by the International Committee of the Red Cross into the actions of Israel and Hamas during the recent conflict in Gaza is expected to accuse Israel of using "excessive force" - prohibited under the fourth Geneva convention. The Red Cross has been collecting information for two parallel inquiries, one into the conduct of Israel and a second into Hamas, both of which will be presented in private to the parties involved. In the case of Israel, the Red Cross is expected to highlight three areas of concern: the Israeli Defence Forces' "use and choice of weapons in a complex and densely populated environment"; the issue of "proportionality"; and concerns over the IDF's lack of distinction between combatants and non-combatants during Operation Cast Lead. Hamas is likely to be challenged over its use of civilian facilities as cover for its fighters; its summary executions and kneecappings of Palestinians during the campaign; and its indiscriminate firing of rockets into civilian areas. Meanwhile, sources at the ICC say it is considering two potential tracks that would permit it to investigate what happened in Gaza. As well as determining whether the PA is recognised internationally as a sufficiently state-like entity, the head of jurisdictions in the office of the international criminal court's prosecutor, Luis Moreno-Ocampo, is looking at whether the court can consider war crimes allegations on the basis of the dual nationality of either victims or alleged perpetrators whose second passport is with a country party to the court. Al Jazeera's new weekly show, Focus On Gaza, correspondent Ayman Mohyeldin visited the village of Khuza'a where residents and human rights experts believe a possible war crime took place during Israel's offensive on the Gaza Strip. Testimony from eyewitnesses, friends, neighbours and human rights experts about the incident tell the story of how a woman carrying a baby and white flag was shot in broad daylight by an Israeli soldier. Nasser al Najar, Rawhiyya's husband, still has the bloodstained white flag he says his wife was carrying when she was killed. Villagers in Khuza'a are accustomed to living under the guns that man the nearby Israeli watchtowers, but Nasser says there are normally no Palestinian resistance fighters in the area and consequently he felt the village would be spared an Israeli raid. However, on January 12, the Israelis began an intense shelling of the area and deployed white phosphorous, a move that was considered a precursor to a ground-based attack. Even though we can see that a lot is happening, practically we should be prepared that in the end nothing ever happens against Israel.